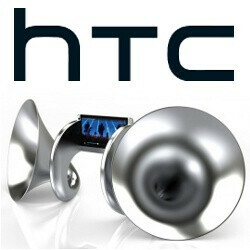 HTC UK has just announced the Gramohorn II, an unusual 3D-printed speaker dock for the HTC One. This audio enhancer looks like a modern art interpretation of the classic gramophone speakers used in the past. It was created by the British designer Justin Wolter during HTC's “Here's to Creativity” campaign, which celebrates the company's 17 years of "innovation and breakthrough in the mobile industry". The Gramohorn II dock is quite unusual as it consists of two enormous gramophone-like horns and a small platform between them which holds the HTC One in the middle. The Gramohorn doesn't need any power at all – actually, it relies on the same mechanics ancient Greeks used when building their amphitheaters. The two “gramohorns” are acoustic resonance chambers that amplify the channeled noise emitted from the BoomSound speakers on the front of the smartphone. This simple technology increases the volume by up to 50% while preserving the quality of the audio. It also boosts low-frequency tones and produces deeper and better music experience for the human ear. The Gramohorn II is 3D-printed out of plaster-based composite material, which is also hand-finished but a limited stainless steel version that is infused with bronze is available as well. "To kick-start our Here's To Creativity campaign Justin has taken the concept of the HTC One's front facing BoomSound stereo speakers and pushed it to the extreme," acknowledged the manager of HTC UK, Peter Frolund. He also admitted that more exciting and creative projects are on their way as a part of HTC's “Here's to Creativity” campaign. You can order the Gramohorn II with custom colour finish at the source link below – the composite version will cost you about $1600, while the metal version is priced at about $8000, which is quite a high price for such an accessory. I wonder why do people manufacture such products.. in fact why people even bother to buy things like these.. C'mon, it's just a HORN. One can easily grab a second hand car for that metal horn's price. look stunning but a little bit weird..
Looks like it's another luxury waste, who would pay for such a price? If it were around $30 I would buy it but the price their asking for is ridiculous. I rather just just get someone to 3d print it for me. People who got $8K to shell out on such an accessory use vertu's and gold iPhones, not HTC One's. It is really a brilliant idea actually...but on that price?? it is a waste of money. Phone speaker or $8000 home theater system... The choice is obvious. 'Tis the horn of Helm Hammerhand. If I play it Gondor will come to my aid?